Commonly thought of as a vegetable, artichokes (also known as globe artichokes) are actually a flower bud. A relative of the famous milk thistle, artichokes stimulate bile flow, which helps to carry toxins from your liver out of your body. Artichokes have been used as an indigestion remedy in Europe for more than a century. 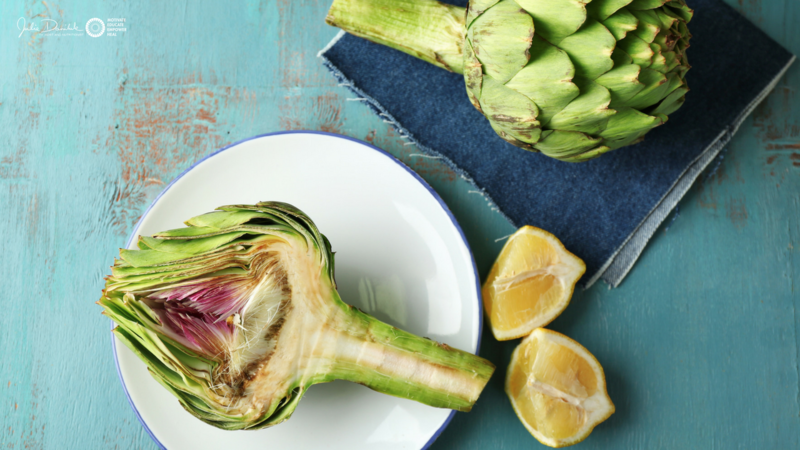 Many liver tonics are bitter, yet artichokes are as delicate as asparagus – and a great finger food. After steaming, pull each leaf off the flower bud, plunk it in some healthy dip and then pull it between your teeth to enjoy the soft green flesh on the inside. When I can’t buy them fresh, I enjoy their hearts – packed in glass with water, NOT oil – only 25 calories each! One artichoke contains about 25% of your daily fibre needs and 16 essential nutrients including Vitamin C, potassium, folic acid and magnesium. Make artichokes a part of your Hot Detox! 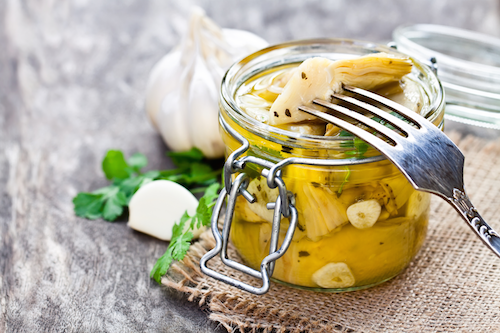 Pickled artichoke hearts packed in pure olive oil or water are a tasty addition to every salad! 1. Artichokes prevent stomach ulcers. Recent research indicates that the extracts in artichokes can be isolated and used to increase the amount of mucous created by the stomach lining.1 This mucous protects your stomach lining from the acids that break down your food and prevents the creation of holes (ulcers) in your stomach lining. 2. Artichokes have antispasmodic effects. Muscle relaxers are often suggested to relieve muscle aches and pain caused by tension and muscle spasm. Artichoke extracts have been shown to be as powerful antispasmodic agents as the often-prescribed papaverine drug. 3. Artichokes have potential as an alternative cancer treatment. Artichokes have been shown to have potent anti-angiogenesis properties (prevent the development of new blood vessels).2 These techniques are often used by cancer patients to stop circulation to tumours, ultimately starving those tumours to death. 4. Artichokes help prevent cardiovascular disease. The high amounts of antioxidants in artichokes prevent the damage to arterial walls that initiates the build-up of cholesterol. 3 Artichokes have also been shown to have blood-lipid lowering capabilities, which make them the ultimate prevention food for cardiovascular disease. 5. Artichokes support healthy eyesight. P.S. Bernstein: “Nutritional Interventions against Age-Related Macular Degeneration.” Acta Hortic. 2009 August 31; 841: 103–112.